The club activities are of two types: regularly scheduled and special events. Each month will feature a General Meeting, Ladies Luncheon, Men’s Breakfast, Game Night, Cocktails on the Cape and Dinner Dance. Weekly events include bocce, bowling and trivia. Special events are scheduled monthly and coordinated by the Activities Coordinator. Some examples of these special events include boat tours, baseball games, and tours of various locations within and around the Cape. Special events are as varied as our members, so keep your eyes peeled and always check the monthly newsletter. You may pick up a copy at the General Meeting on the first Tuesday of the month at the Yacht Club (9 am) or check out current and back copies here. See upcoming activities on our Calendar below. 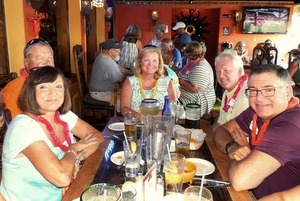 Socialize with fellow members at a different local bar or restaurant every month. 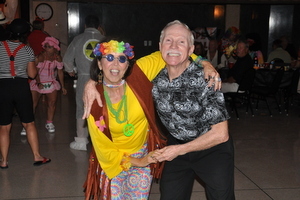 Enjoy local entertainers, dinner and dancing at the Cape Coral Yacht Club every month. 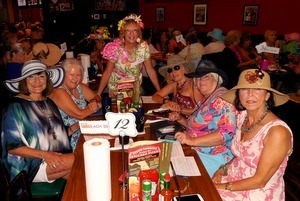 Each month the ladies get together at a different restaurant for lunch and laughter. After dessert, lady luck enters with lots of raffle prizes. 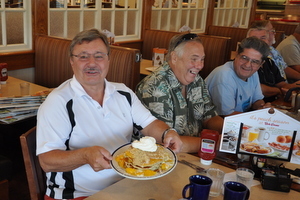 Each month the men get together for breakfast at a local restaurant. It gives the men a chance to get to know each other better and to discuss common interests over a hearty breakfast.